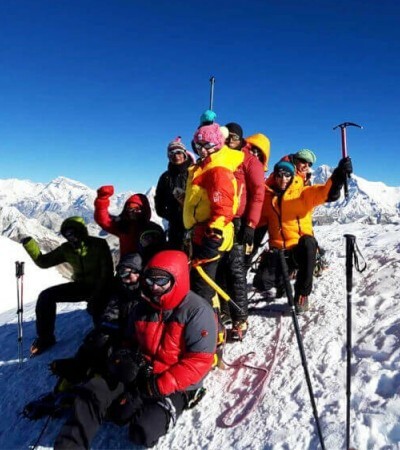 The popular Island Peak Climbing in the Everest region has attracted the peak climbers from all over the world. The Peak has enticed not only the climbers, but also to the trekkers in Everest Base Camp. Situated between the Everest Himalayas, Island Peak (6189m) is locally called the Imja Tse, which was the first ascended in 1956 AD by a Swiss Climbing Team. The climbing to Island Peak Package becomes more overwhelming as it adjoins the Everest Base Camp Trekking along the trip. The Island Peak Climbing Package begins with a short flight to the Himalayan airport Lukla, the trekking to Everest Base Camp also starts from there. Marching through the upper trail to the glacial River, the trek crosses Phakding and Monjo to ascend the Sherpa heartland of Namche Bazaar. Similarly, exploring the traditional Sherpa cultural lifestyles and the Himalayan views of Everest, Lhotse, Nuptse and others give the positive energy and works as acclimatization. In the same way, the hike to Kalapatthar adds the further charm in this trekking trail which is considered as the viewpoint for looking the surrounding Himalayan ranges. Everest Base Camp trekking before climbing the peak makes the climbers physically fit and more acclimatization. After descending from the Everest Base Camp, it is a continual trek to the Island peak base camp. Besides, Island peak is normally covered by the heap of snow. Peak Climbers get climbing practices and training along with the way of using peak climbing equipments. With a gentle climb to Island Peak, it descends to the base camp and continues the trek to Namche Bazaar and to Lukla. Then finally you have a flight back to Kathmandu. During the Island Peak climbing trip, the Rising Adventure Company manages all required arrangements. We are conscious of the physical condition, altitude sickness and any problems of the fitness of our clients. Hygiene foods and hot drinks are supplied to the climbers. For more details please, feel free to contact us. Day 09 :Trek to Gorakshep (5130m/ 16831 ft), 3-4 hrs and hike to Everest Base Camp (5340m/ 17520 ft), 4-5 hrs. Overnight in Gorkshep. Others expenses which are not mentioned in trip "Cost includes"